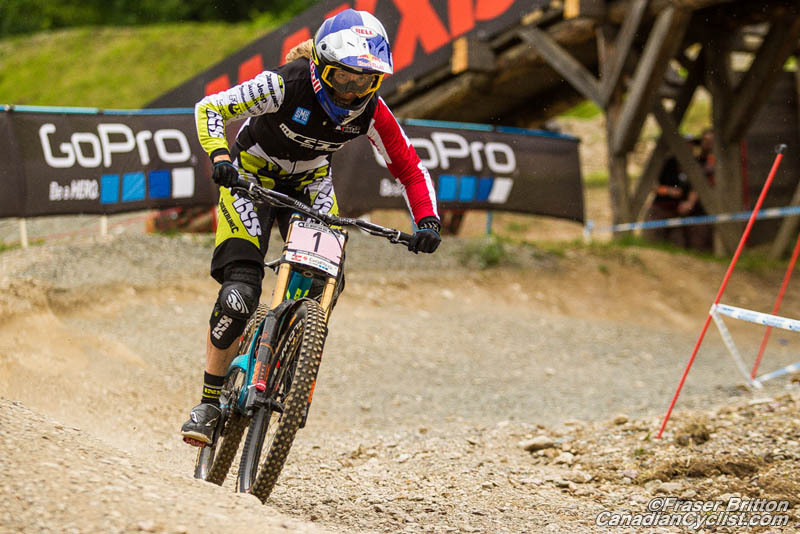 Round 3 of the Downhill series at the UCI Mountain Bike World Cup presented by Shimano, in Leogang, Austria, saw Rachel Atherton (GT Factory) solidify her lead in the women's standings with her second straight win, while Aaron Gwin (Specialized) also extended his lead in the men's series with his win. Race organizers at Leogang made some major changes to the course for 2015, adding in more natural features, changing lines and extending jumps. This proved to be the winning formula for Atherton, who recorded her first win here, and the 22nd of her career. Morgane Charre (Solid-Reverse Factory Racing) recorded the first sub-4:20 time, at eight riders to go. She was immediately followed on the track by world champion Manon Carpenter (Madison Saracen), who continues to struggle this season, and was disqualified for going off course. Following Carpenter, Emilie Siegenthaler (Pivot Factory DH) bumped Charre out of the Hot Seat by four seconds to take over the top spot. Siegenthaler's time would prove good enough for fourth, but much quicker riders were coming down, and Tahnee Seagrave (FMD Racing), the third fastest qualifier knocked an impressive seven seconds off the leading time. Only Round 1 winner Emmeline Ragot (MS Mondraker) and Atherton were left to ride, and Ragot came in less than two-tenths of a second behind Seagrave. Finally, it was Rachel Atherton, and she was clearly on a good run, nearly two seconds ahead by the second split, and three seconds up at the finish line. 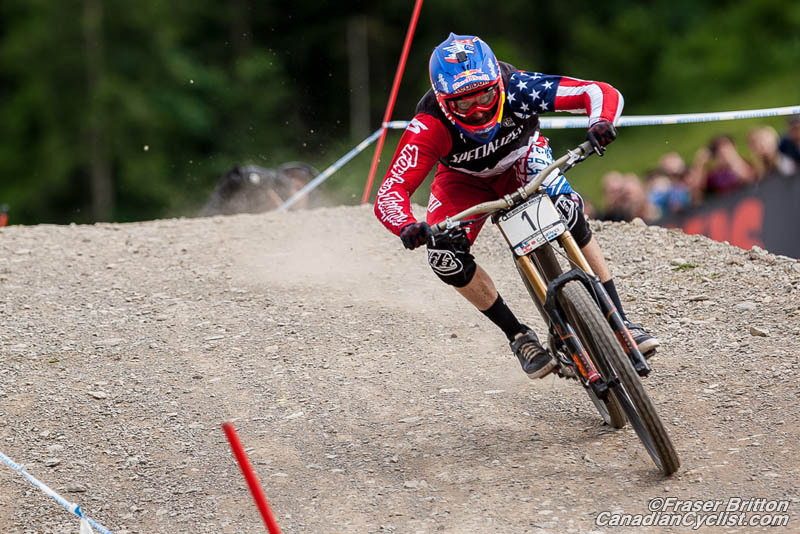 "I enjoyed my race run," said Atherton. "It's pretty amazing to know that you have to go as fast as you can to have a chance. It's always good to go fast in qualifying, but it gives everyone else a benchmark. It started raining at the top and I was a bit worried, because it was a bit slippery up there, but the bottom was dry so it was okay." Atherton, with two wins and a second place, leads the standings with 670 points, followed by Ragot at 585 and Seagrave at 446 points. Loris Vergier (Lapierre Gravity Republic), the eighth rider off, proved to be very hard to dislodge from the Hot Seat with a time of 3:41.985. He held the top position through 40 riders before Harry Heath (Norco Factory) finally knocked a few tenths of a second off his time. However, the times were all more than six seconds slower than Aaron Gwin's (Specialized) top qualifying time, so it was bound to get faster, and they did as the final 20 started, with Round 1 World Cup leader Loic Bruni (Lapierre Gravity Republic) knocked two and a half seconds off Heath's time, but still three seconds slower than Gwin's qualifier. Bruni started earlier than expected after crashing in qualifying. As the race entered the final ten men, Bruni still held the Hot Seat, as a head wind along the pedaling section seemed to be slowing challengers. Finally, Troy Brosnan (Specialized), with eight riders to go, was able to beat Bruni, by 2.757 seconds, however, still six-tenths slower than Gwin in qualifying. Round 2 winner Greg Minnaar, winner of the world championships in Leogang in 2012 and fifth fastest qualifier, came within four-tenths of a second of Brosnan, but the Australian champion still held the lead. World champion Gee Atherton (GT Factory) slotted in behind Minnaar and it was down to the final three. Remi Thirion (Commencal/Vallnord) then knocked another 0.239 seconds off the leading time, but Connor Fearon (Kona Factory) smashes the top time by nearly 1.3 seconds, leaving only Aaron Gwin with a chance of winning. Then Gwin broke his chain out of the start gate and it seemed over. But the American champion incredibly managed to maintain his composure and coast his way down the entire course to win by 0.045 seconds, the 12th World Cup victory of his career. 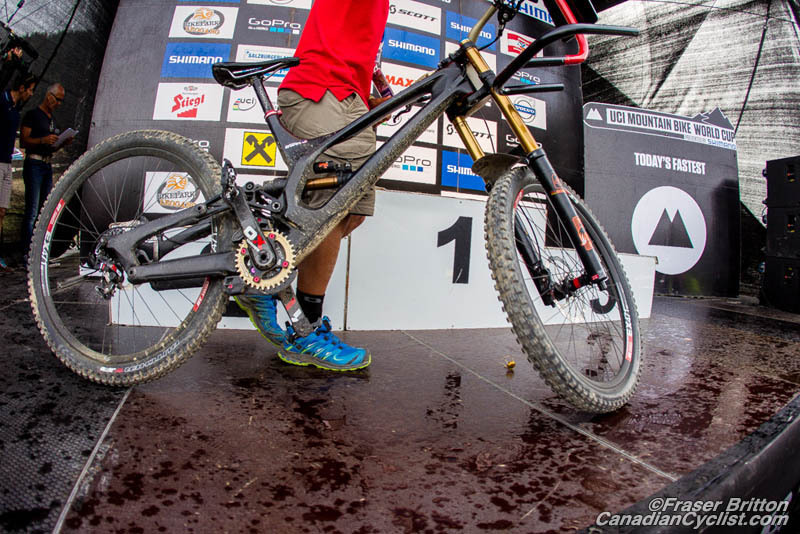 "First pedal out of the gate the chain snapped," explained Gwin. "Luckily, there is not much pedaling here except for the middle section, so I just tried to put my head down and charge as hard as I could. It was a little bit windy, so I was just trying to tuck, and make the most of it. it was just 'game on' and try to push as hard as I could. I can't believe it, it's awesome. For some reason, I have weird things happen here [Leogang] every year, so when the chain broke, I thought, 'Nope, not today, there's air in the tires so I'm getting it down'." Gwin now extends his lead in the overall standings with 624 points, followed by Loic Bruni with 435 points and Greg Minnaar in third at 413. In the Junior men's category, Andrew Crimmins (Kona Factory) qualified first on Saturday and maintained that spot in the Final, finishing three seconds ahead of Jacob Dickson (Orange Dirt, XFusion). Crimmins also took the overall lead with his second win of the season, with 132 points to former leader Laurie Greenland's (Trek World Racing) 110.